Street food experts KERB have unveiled another regular event - Saturdays at Granary Square, outside Central St Martins college, and just North of King's Cross station. So far just three are planned - 29th June, 3rd August & 7th September, but if this works (& we hope it will) there are plans to roll out to other parts of the city. Please support this! 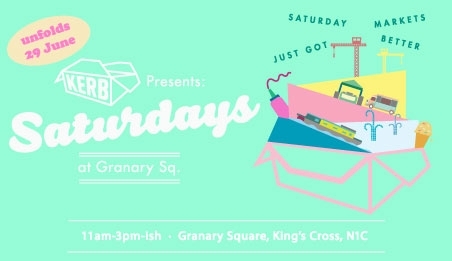 "Granary Square is an interesting space - over-looked by the imposing Central St Martins, fringed by two brilliant and unusual restaurants, carpetted with beds of fountains, hemmed by a canal and peppered with a copse of trees - and now we are turning it into a space for a new kind of Saturday market for the city. If we can make it here then we're in a great position to take the idea to other parts of London. The 29th June is the first of this 3-part KERB Saturdays pilot - part 2 is in August, part 3 in September. Come and help us make it happen - and as ever, come hungry! Added extras: Food-Cycle reclaimed snacks, the Calthorpe Project homemade chutneys + shrubs, newspapers, deck chairs"